At the age of 92, Irma Elizabeth Abel Seydel put her memories to paper. 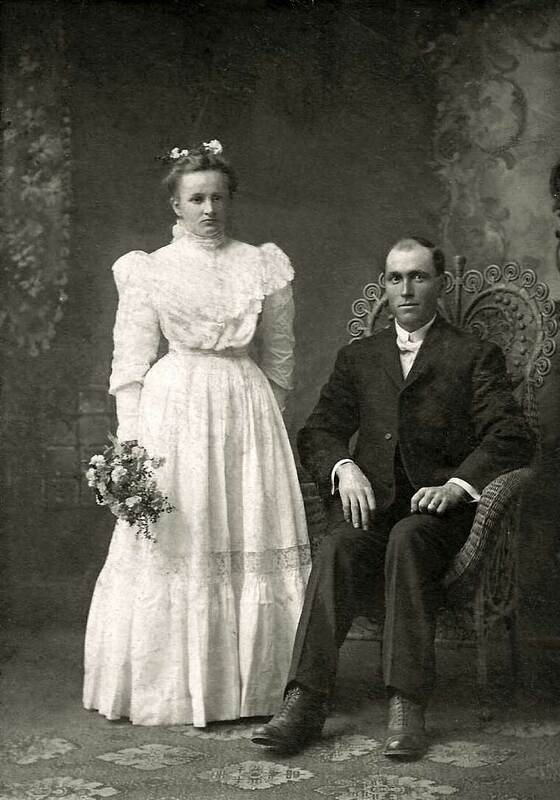 Wedding of Elizabeth Groggel and Henry Abel, 16 Nov 1905. Irma was the first-born of Elizabeth Groggel and Henry Abel. Henry was the 5th child of my great-grandfather Johann Wilhelm Abel and the second child of his second wife, Anna Lutje Kramer. 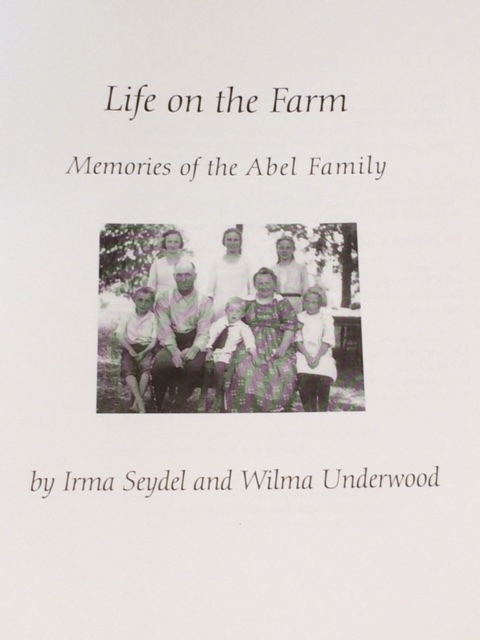 The first, and larger part of the book is written from the perspective of Irma while the second part contains the memories of her 4 year younger sister, Johanna “Wilma” Abel Underwood. The Abel family farm that is referred to in this book is that of Elizabeth & Henry, who lived most of their married life on their 80 acre dairy farm on 40th Street in Blendon Township, near Bauer. I am so grateful that I am now abel to have this additional historical view back to my great-grandfather. I have very few memories of my Grandpa Abel’s family, he himself died before my tenth birthday and Grandma Abel died shortly thereafter. My memories are negatives, from my mother; J.W.Abel must have had another family back in Germany because of his trips back there without others, a dispute over the fact that his German son would marry a Dutch girl, and an overbearing Aunt Til (Mathilda Abel) who seemed to dislike everything. To now have the memories of two of my mother’s elder cousins is invaluable in my understanding of the Abel family. A few more pieces have been added to the puzzle picture! Irma writes of a memory she held from the age of four: “Visits by Grandfather [Johann Wilhelm] Abel who lived near our first home in Blendon Township are an early childhood memory. He was a white haired, long white bearded man, nearly totally blind, who walked with a cane. Mother apparently saw him coming along the road to our house. She would send me out to the road to greet him and lead him to our house. He sat and visited with Mother for awhile and then walked back to is home.” J.W. Abel died in September 1910. I found a few of her recollections that are particularly interesting to me, memories that need to be verified…memories can be tricky, you know! Johann Wilhelm Abel was abel to afford a better life when he settled in Ottawa County because he had married a relatively affluent woman back in Germany, Ida Vincentia Steinshen. The book mentions that they purchased a large piece of land and built a large home and barn. As each of his sons married, they were provided with their own nearby farms, complete with buildings. Was this true for my grandfather? How did he end up in adjacent Georgetown Township? I will have to get back in contact with the Steinshen family. I visited with them in western Germany several years ago and enjoyed a very warm and friendly welcome. Johann Wilhelm Abel valued education. His son, Henry was provided with an 8th grade education and attended the German School in Grand Rapids during the winter months. Classes were conducted by the Reverend Schrieber of the Lutheran Church. Is this true for all of his sons? And daughters? I have seen letters written by J.W. Abel which were posted back to his family in Germany. They are written in beautiful script and when translated for me, sounded to be well written; he was obviously an educated man. I have already begun the dig into this school; this would be very interesting in and of itself. Irma was born in 1906, when her family was then living on their Barry Road farm in Blendon Township. The family of Maggie and John Bohl and their two sons, Reuben and Pearl lived across the street. My grandpa Fred Abel had a hunting friend, Reub Bohl..who owned the Bohl Motel along Chicago Drive. It would be interesting to know if their relationship went back to Germany. The trunk that Johann Wm Abel used on his immigration into Michigan, described as being 5 feet long, 2 feet wide and 2 feet deep. “It is of wooden construction, unpainted, unlined and banded with about 1 ½ inch iron strips and a hasp closure-locked with a Yale-type lock. The chest had to contain the only belongings the family was allowed to take from their homeland to the new country.” As of publication date, the trunk was still in existence and in the Henry Abel (1878-1952)l family…I want to see that treasure! Regrettably, I believe that I have just received the last copy of this special book. I had requested three copies so that I could share the other two but only one copy was found. Perhaps with some encouragement, another printing could be done? Meanwhile, I am happy to answer any questions that you may have concerning the contents of the book.